Today with the emerging trend cities are almost flooded with number of cinema houses and we might have seen some cinema houses are houseful every time while others wait for their customers. The reason is much relative to Vastu as many constructed cinema halls have Vastu defects due to which they face hardships and sometimes need to shut down. Cinema hall should always be constructed on lively plot in terms of functionality and sand identification; therefore a veteran Vastu consult must be consulted before checking for the site. Avoid purchasing land which has been used as morgue, crematory, hospital or any other dead infertile place. Construction of cinema hall should begin from West to South and must be heavy here. Screen of the cinema hall should be installed in such a way that viewers face East or North while watching movie. Projectors should be installed in South-west direction. Placing electrical equipments in South-east can turns things successful. Public toilets should be built in North-west and WC facing North or South. Parking is ideal in South-west portion. Canteen or kitchen should be constructed only in South-east portion. There are many other things which need to examine and taken care of before constructing expensive Movie hall so that it turn out to be most visited successful hall. We have to take care of the following points while studying about the vastu of the movie halls. 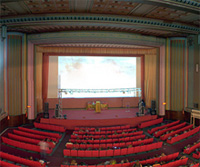 Vastu consultation of movie halls involves a thorough analysis.